Temperature Range Varies with Cable Selection and Accuracy Class (See Description Below). Air/Gas Measurement Sensors with Open Ends and Vent Holes. Probes Available in 6mm, 3mm, 1/8" and 1/4" Diameters. Omega's line of Ultra-Precise RTD temperature sensors provide customers with a product that offers sensor accuracies that are far tighter than are available in most standard RTD sensors on the market today. These sensors are manufactured using DIN Platinum RTD elements (temperature coefficient = .00385 ohm/ohm/°C) with Class A, Class 1/3DIN or Class 1/10DIN accuracies. This makes Omega's Ultra-Precise RTDs among the most accurate industrial temperature sensors available. Type P-M style closed ended immersion sensors for use where the sensors will be immersed in a fluid. Type P-L style exposed element sensors for use in direct contact with air or gasses for more accurate measurement of these substances. There are four probe diameters available including 3mm, 6mm, 1/8" and 1/4", with lengths starting at 50mm (2") with a number of standard lengths available (see ordering table below). A variety of mounting threads are available including: 6x1mm, 8x1mm, 10x1mm, 1/8NPT, 1/4NPT, 3/8NPT and 1/2NPT (Note: 6mm mounting threads are not available on 6mm diameter probes). Please note that 1/8" and 3mm diameter probes without threaded fittings and with "-P", "-PS", "-TS", "-GS" and "-S" cables include a transition fitting at the end of the sheath to accommodate the cable diameter. If a transition fitting is not acceptable, then a type "-T" or "-G" cable must be specified. Please note that the minimum recommended length for 1/10DIN accuracy probes is 6” for 1/4" (150mm for 6mm) diameter probes, and 4” for 1/8” (100mm for 3mm) diameter probes. This is due to the fact that in order to achieve these accuracies all stem conduction effects in the sensor must be eliminated. Also, please note that in order to lab certify 1/10DIN accuracy RTDs, it may be necessary for the probes to be longer than these lengths depending on the test equipment used to perform the certification. Omega can make these products shorter than the recommended lengths, but we cannot guarantee their performance. For 1/3DIN probes, a minimum length of 4.75" applies for 1/4" (120mm for 6mm) probes and 2.38" for 1/8" (60mm for 3mm) diameter probes. 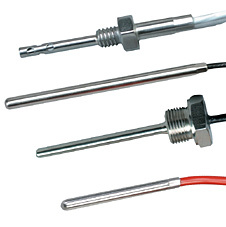 P-M-A-1/8-6-0-T-3 has a Class A Element = -100 to 450°C, and "T" (PFA) Cable = -100 to 250°C, resulting in a sensor temperature range of -100 TO 250°C. P-M-1/10-1/4-9-1/2-P-3 has a 1/10DIN Element = 0 to 100°C, and a P (PVC) Cable = -29 to 100°C, resulting in a sensor temperature range of 0 to 100°C. PVC Insulated ("P") and PVC Insulated and Shielded ("PS") Cables -29 to 100°C. PFA Insulated ("T") and PFA Insulated and Shielded ("TS) Cables: -100 to 250°C. Fiberglass Insulated ("G") and Fiberglass Insulated and Overbraided ("GS") Cables: -73 to 400°C. Silicone Insulated ("S") Cables: -50 to 200°C. Your Ultra-Precise RTD sensor can be combined with a wide variety of equipment and accessories to construct an entire measurement and control system. Select from a wide variety of controllers, panel meters, transmitters, recorders and data loggers to monitor, control and record your process. See the links below to view a sampling of our complimentary products, or call our Customer Service Representatives and Application Engineers for assistance in selecting the right products for your needs. Accuracy: 1/10 DIN. Sheath: Closed End, 4" Long 1/4" Diameter, No Threaded Fitting. Leadwire: 3 Feet (1m), PVC Insulated. Accuracy: 1/3DIN. Sheath: Closed End, 6" (150mm) Long 1/8" Diameter, No Fitting. Leadwire: 3 Feet (1m), PFA Insulated. Accuracy: 1/3DIN. Sheath: Closed End, 6" (150mm) Long 1/8" Diameter, 3/8 NPT Fitting. Leadwire: 3 Feet (1m), PFA Insulated. Accuracy: Class “A”. Sheath: Closed End, 6" (150mm) Long 1/4" Diameter, 1/2 NPT Fitting. Leadwire: 12 Feet (3.6 meters), PVC Insulated, Shielded. Accuracy: Class “A”. Sheath: Closed End, 6" (150mm) Long 1/4" Diameter, No Mounting Fitting. Leadwire: 3 Feet (1m), PFA Insulated. Accuracy: Class “A”. Sheath: Closed End, 6" (150mm) Long, 1/2 NPT Fitting. Leadwire: 3 Feet (1m), PFA Insulated, Shielded. Accuracy: Class “A”. Sheath: Closed End, 6" (150mm) Long 1/8" Diameter, 1/2 NPT Mounting Fitting. Leadwire: 5 Feet (1.5 meters), PFA Insulated & Shielded. Accuracy: Class “A”. Sheath: Air Sensor, 6" (150mm) Long 1/8" Diameter, No Mounting Fitting. Leadwire: 3 Feet (1 meter), PFA Insulated Cable. Accuracy: Class “A”. Sheath: Air Sensor, 6" (150mm) Long 1/8" Diameter, 1/8 NPT Mounting Fitting. Leadwire: 3 Feet (1 meter), PFA Insulated Cable. Accuracy: Class “A”. Sheath: Air Sensor, 6" (150mm) Long 1/4" Diameter, 1/4 NPT Mounting Fitting. Leadwire: 6 Feet (2 meters), PFA Insulated. Accuracy: Class “A”. Sheath: Air Sensor, 6" (150mm) Long 1/4" Diameter, No Mounting Fitting. Leadwire: 3 Feet (1 meter), PVC Insulated Cable. Nota: For longer sheath length, change "-6" in model to desired length in inches and add $1 per inch to price when longer than 8". For Silicone Rubber insulated cable, change "-P", "-T" or "-G" to "-S" in the model number and use PFA pricing. For longer cable lengths, change "-3" to desired length in feet and add $0.40/ft for PVC, $0.95/ft for PFA or Silicone Rubber and $1.50/ft for fiberglass. For shielding on PVC, PFA or Fiberglass insulated cables, change "P", "T" or "G" to "PS", "TS" or "GS" and add $0.25 per foot to the price. Mounting threads also available in 1/4 NPT, 3/8 NPT and 1/2 NPT at the same price. 1/8" diameter sensors without threaded fittings and with "P", "PS", "TS", "GS" and "S" cables include a transition fitting at the end of the sheath. For metric diameter probes multiply price/ft adders by 3.28 and round to the nearest $0.10.